May 23, 2017: Fifty years ago today, state-run media in Cairo announced that Egyptian president Gamal Abdel Nasser had closed the Straits of Tiran to Israeli shipping, cutting off the Jewish state's access to the Red Sea. Then-President Lyndon Johnson later said of the Six-Day War, which erupted two weeks later, "If a single act of folly was more responsible for this explosion than any other, it was the arbitrary and dangerous announced decision that the Straits of Tiran would be closed. The right of innocent, maritime passage must be preserved for all nations." A half-century later, however, a "historiographical rewriting" of the Six-Day War has "effectively become the received dogma, echoed by some of the most widely used college textbooks about the Middle East," as Gabriel Glickman explains in this advance-release article from the Summer 2017 issue of Middle East Quarterly. 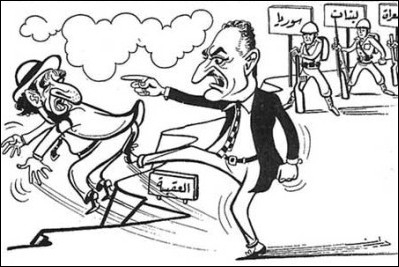 A cartoon from 1967 shows Nasser kicking Israel over a cliff. Jerusalem's attempt before the Six-Day War to prevent hostilities is completely ignored or dismissed while the Arab war preparations are framed as a show of force against an alleged, imminent Israeli attack on Syria. It is a general law that every war is fought twice—first on the battlefield, then in the historiographical arena—and so it has been with the June 1967 Arab-Israeli war (or the Six-Day War as it is commonly known). No sooner had the dust settled on the battlefield than the Arabs and their Western partisans began rewriting the conflict's narrative with aggressors turned into hapless victims and defenders turned into aggressors. Jerusalem's weeks-long attempt to prevent the outbreak of hostilities in the face of a rapidly tightening Arab noose is completely ignored or dismissed as a disingenuous ploy; by contrast, the extensive Arab war preparations with the explicit aim of destroying the Jewish state is whitewashed as a demonstrative show of force to deter an imminent Israeli attack on Syria. It has even been suggested that Jerusalem lured the Arab states into war in order to expand its territory at their expense. So successful has this historiographical rewriting been that, fifty years after the war, these "alternative facts" have effectively become the received dogma, echoed by some of the most widely used college textbooks about the Middle East. The first step to absolving the Arab leaders of culpability for the conflict—especially Egyptian president Gamal Abdel Nasser, who set in motion the course of events that led to war—was to present them as victims of their fully understandable, if highly unfortunate, overreaction to a Soviet warning of an imminent Israeli attack on Syria. Taking at face value Nasser's postwar denial of any intention to attack Israel, educated Westerners—intellectuals, Middle East experts, and journalists—excused his dogged drive to war as an inescapable grandstanding aimed at shoring up his position in the face of relentless criticism by the conservative Arab states and the more militant elements within his administration. 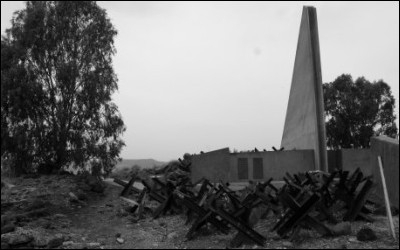 The remains of a Syrian fortification on the Golan Heights following the Six-Day War. Nasser realized that no Israeli attack on Syria was in the offing yet continued his reckless escalation toward war. "President Nasser had to take spectacular action in order to avert defeat in the struggle for leadership of the Arabs," argued American historian Ernest Dawn shortly after the war. "If Egypt had not acted, the 'conservatives' would have wasted no time in pointing to the hero's feet of clay." This claim was amplified by Charles Yost, U.S. president Lyndon Johnson's special envoy to the Middle East at the time of the crisis, as well as a string of early popular books on the war. Nasser had no intention of taking on Israel, they argued. The massive deployment of Egyptian troops in Sinai, in flagrant violation of the peninsula's demilitarization since the 1956 war; the expulsion of the U.N. observers deployed on the Egyptian side of the border with Israel; the closure of the Tiran Strait to Israeli navigation; and the rapid formation of an all-Arab war coalition for what he pledged would be the final battle for Israel's destruction were just posturing moves geared to deterring an Israeli attack on Syria and enhancing Nasser's pan-Arab prestige. Unfortunately, goes the narrative, Jerusalem overreacted to these measures, if not exploited them to its self-serving ends, by attacking its peaceable Arab neighbors. While this thesis clearly does not hold water—Nasser realized within less than a day that no Israeli attack on Syria was in the offing yet continued his reckless escalation—it has quickly become a common historiographical axiom regarding the war's origin. Thus, as ideologically divergent commentators as British journalist David Hirst and American military commentator Trevor Dupuy agreed on this view in the late 1970s. According to Dupuy, "it is very clear in retrospect that President Nasser did not in fact have any intention of precipitating war against Israel at that time." Hirst took this argument a step further: "Not only did Nasser lack the means to take on Israel, he did not have the intention either." Nasser had reversed Egypt's 1956 losses with his action on shipping and with the removal of UNEF. If he could avoid an Israeli attack, he would have successfully stood up for the Arab cause, cost-free... Any indication that Egypt might attack was lacking. Indeed, so prevalent is the belief that Nasser did not intend to use his forces against Israel that anti-Israel extremist Norman Finkelstein confidently concluded that this was one of "only two issues in the otherwise highly contentious literature on the June 1967 war on which a consensus seems to exist." Nasser sent a double message to Israel: Egypt had no aggressive designs, but neither would it suffer any Israeli aggression against Syria. While writing the book, Oren was a researcher at the conservative Shalem Center and was later appointed Washington ambassador by Prime Minister Benjamin Netanyahu. So if an Israeli scholar on the right-wing end of the spectrum can portray the Jewish state as equally culpable for the war, rather than as the intended target of an imminent all-Arab aggression, while also vastly understating Nasser's role in precipitating the conflict, and if this account is warmly endorsed by former Prime Minister Ehud Barak, then surely it must be true. The Arab regimes were stunned by the magnitude of their defeat in the war: In six days, Israeli forces routed the Egyptian, Syrian, and Jordanian armies as well as an Iraqi expedition force and extended its control over Arab territories five times its own size. Some analysts have gone a step further in substituting victim for aggressor by blaming Jerusalem (rather than Cairo) for triggering the prewar crisis. Even the eminent French intellectual Raymond Aron, by no means an enemy of Israel, wondered during the war whether "General [Yitzhak] Rabin's threats against Syria [led] President Nasser to fear an American plot of which he would be the next victim." But Nasser was certainly aware that there was no Israeli threat to Syria, and Rabin made no such threat. Rather, his alleged comments had been mixed up with an off-the-record press briefing by the head of military intelligence, Maj. Gen. Aharon Yariv, in which Yariv stressed the need for "an operation designed to warn the Syrians [and Egyptians] of the dangers of an all-out confrontation, not an operation that would itself be the confrontation." Still, the dogmatic denizens of Middle Eastern studies were not bothered by such factual niceties. Richard Parker, a veteran U.S. career diplomat in the Middle East and editor of the Middle East Journal, interchangeably blamed Israeli security reprisals against Syria for the slide to war, tying them to the false Soviet warning of an imminent Israeli attack against Damascus. In another influential account, William Quandt, a U.S. government official and Middle Eastern studies professor, inexorably leads his readers to the foregone conclusion that Jerusalem, against Washington's better advice, took the first shots of the war—when, in reality, the road to war had been paved by the Arab states' ganging up on Israel since mid-May and their vows to destroy it. This absolution of Nasser (and the Arab states more generally) creates the impression that the Israelis wanted war while the Arabs did not. Adding to the high profile and assumed historiographical veracity of these two accounts was the authors' access to inside information in their past government capacities, something that was readily acknowledged by both authors, as was Quandt's alleged access (while in government) to documents prior to their release by the U.S. archives. found public opinion [in Norway] regarded the Palestine problem almost entirely from the Israeli point of view ... this was a problem with which I had been living for many years, and one which, as I had become very much aware, had at least two sides to it. Bull, however, proceeded to criticize Israel alone in his account of the tumultuous years preceding the Six-Day War. 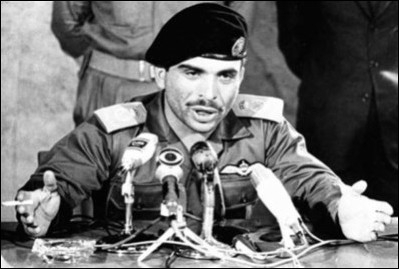 These accusations are all the more bizarre given that it was Bull who passed some of Israel's secret messages to Jordan's King Hussein upon the outbreak of hostilities on the Egyptian front, pleading with him to stay out of the fighting and pledging that in such an eventuality no harm would be visited upon his kingdom. The absolution of Nasser creates the false impression that the Israelis wanted war while the Arabs did not. Israel's policy of retaliation had lately exacerbated the conflict. But for Samu and the battle of 7 April, there would not have been a war in 1967... Then, in a few years' time, some Arab governments might be readier to resign themselves to Israel's existence. Andrew and Leslie Cockburn—known for their harsh criticism of Israel—and Winston and Randolph Churchill—labelled as "friendly commentator[s] of the Six Day War" by Abba Eban—concurred on the likely existence of secret U.S. support for Israel despite President Johnson's meek public display of support. 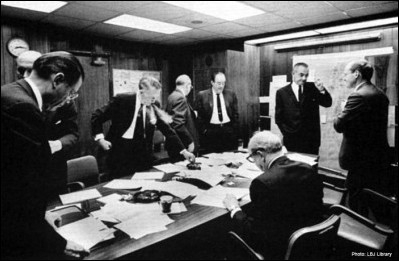 U.S. president Lyndon B. Johnson (2nd from right) in the White House Situation Room during the Six-Day War. The administration was far from resolute in its support of Israel. It considered a scenario involving military action against the Jewish state. We find that there is a vast array of possible contingencies that could develop out of the current situation... The use of our forces against Israel, even under U.N. cover, would certainly arouse domestic protest except in extreme cases of Israeli provocation or aggression. The wars of 1948 and of 1973 were unmistakably launched by the decision of Arab governments... Responsibility for the war of 1967 is more difficult to allocate. As more information becomes available about the sequence of events leading to the opening of hostilities, it seems that the participants were like characters in a Greek tragedy, in which at every stage the various actors had no choice but to take the next step on the path to war. During the run-up to war, the Egyptian state-controlled media repeatedly accused Washington of "seeking excuses for an armed intervention against the Arab nation to support Israel," with Nasser himself claiming that "Israel today is the United States"—effectively equating war against Israel with fighting the United States. Once the extraordinary magnitude of the Arab defeat transpired, the most implausible conspiracy theories were swiftly spawned. Foremost among these was the claim that Israel did not actually win the war; rather the United States won it on its behalf, both by arming the Jewish state to its teeth—although France was Israel's main arms supplier at the time—and by destroying the Egyptian air force. It has even been argued that in triggering the war, Jerusalem was merely a pawn in Washington's ploy to divert American public opinion from the unwinnable war in Vietnam. Some claimed that Jerusalem was a pawn in Washington's ploy to divert American public opinion from the war in Vietnam. The notion quickly gained its dedicated subscribers. Thus, the idea was put forward in a biography of Nasser by the veteran British diplomat Anthony Nutting as well as in a collection of essays on the Arab perspective on the war, including an essay, "The Arab Portrayed," in which Edward Said appears to have set up the prototype for his Orientalism book. As late as 2008, the American historian Douglas Little attributed Nasser's defeat to the fictional collusion between Washington and Jerusalem, which enabled "Israel's swift seizure of the Sinai, the West Bank, and the Golan Heights, with the blessing of Lyndon Johnson." But the story does not end here. In the eyes of a growing number of Western observers of the Middle East, the alleged Israeli machinations against Syria, whether or not in cahoots with Washington, were not related to actual developments on the ground (e.g., the all-Arab attempt to divert the headwaters of the Jordan River so as to deny them to Israel). Rather, such maneuvers were a vital link in a long chain of aggressions stemming from the Jewish state's very existence as a colonial outpost in the midst of the Arab world. David Hirst gave this thesis a name: "Greater Israel." The West Bank was not involved in the growing Egyptian-Israeli crisis before King Hussein (above) joined Nasser's bandwagon some two weeks after its flare-up. Had the king heeded Jerusalem's secret appeals on June 5 to stay out of the war, the territory would have remained under Jordanian control. It is difficult not to give some credit to the subsidiary hypothesis: that the situation was stirred up by the Israeli activist clique as part of a manoeuvre to provoke an Arab reaction which would force Israel to assume an "energetic" policy and bring them back into power [i.e., Ben-Gurion]. Rodinson's extreme anti-Israel animosity is further revealed in the Jewish state's denigration as an alien colonial imposition on a hapless native population and his appeal for the removal of Israel's Jewish identity (i.e., its effective elimination) in favor of a binational state as a means to avoid more wars in the future. While Rodinson's thesis of a colonial-settler Jewish state by its very existence impeding the prospects of a peaceful Middle East was hardly original, echoing as it did longstanding Marxist precepts and more recent Palestine Liberation Organization (PLO) propaganda, his book resonated over time, helping to plant the seeds of the "postcolonial paradigm" that was to gain preeminence in Middle Eastern studies in future decades. Following in Rodinson's footsteps, some historians took it upon themselves to be deliberately subjective in their work in order to correct a historical narrative that they viewed as having been biased in favor of the victor (i.e., Israel), hence harmful to the public's understanding of the Israeli-Palestinian conflict that came to the forefront as a result of the war. Abdullah Schleifer, for example, an American Jewish convert to Islam, journalist, and eyewitness observer of the war, argued in his 1972 book, The Fall of Jerusalem, that the victory of the Jewish state was mistakenly described by early accounts as a "miracle" when it was actually the culmination of long-standing Israeli aggression in the region. Similarly, it has become commonplace among scholars to depict the 1967 war as a premeditated campaign by Israeli leaders to expand beyond the country's borders. Thus, for example, one of the most recent book-length histories—Quigley's 2013 account—contains the following conclusion about Israel's, not Nasser's, ultimate culpability for the war: "The June 1967 war, rather than serving as precedent for preventative war, should be the poster child for pretextual invocation of force used in advance [by Israel]." A similar explanation was offered by other scholars. Israel knew itself to be militarily and politically stronger than its Arab neighbours ... in the face of threats from those neighbours, the best course was to show its strength. This might lead to a more stable agreement than it had been able to achieve; but behind this there lay the hope of conquering the rest of Palestine and ending the unfinished business of 1948. This assertion does not even stand a simple scrutiny of the prewar timeline. The West Bank had not been implicated in the evolving Egyptian-Israeli crisis before King Hussein joined Nasser's bandwagon some two weeks after its flare-up; and even then, had the king heeded Jerusalem's secret appeals on June 5 to stay out of the war, this territory would have remained under Jordanian control. Yet, if a leading historian of the Middle East could endorse such an ahistorical travesty, it is hardly surprising that other similarly prominent historians, whose expertise lies outside the Middle East, fell for this conspiracy theory. For example, Tony Judt, a British historian of Europe, wrote that "the war of 1967 is best regarded in the light in which Israel's generals saw it at the time: as unfinished business left over from the War of Independence." They say that history is written by the victor, but the 1967 war has been rewritten by the losers and their international champions. Just as the failed pan-Arab attempt to destroy Israel at birth has been transformed into a "catastrophe" (or Nakba) inflicted on the unfortunate and peaceable Arabs by an aggressive foreign invader, so the stillborn attempt to complete the unfinished business of 1948 has been turned into yet another story of Arab victimhood, though it is unclear to what extent this narrative has been accepted by Western publics at large. The 1967 war, the Arabs' attempt to complete the unfinished business of 1948, has been turned into another story of Arab victimhood. moves on the global stage. The British historian Elie Kedourie once commented that "the threat to use military force is not, in principle, different from the use of force itself." Nasser, followed by the heads of most Arab states, not to mention PLO chairman Ahmad Shuqeiri, indulged in weeks of extermination threats vis-à-vis Israel. It is not the job of the historian to play the role of psychologist and attempt to substitute victimhood for malignant incompetence and shortsightedness. Gabriel Glickman, a California-based researcher, holds a Ph.D. in Middle Eastern Studies from King's College London. He is currently working on a book provisionally entitled Western Historiography of the Six Day War: Rethinking the Road to War. See, for example, Charles D. Smith, Palestine and the Arab-Israeli Conflict: A History with Documents, 5th ed. (Boston and New York: Bedford-St. Martin's, 2004), p. 282; Mark Tessler, A History of the Israeli-Palestinian Conflict (Bloomington: Indiana University Press, 2009), p. 387; Cheryl A. Rubenberg, ed., Encyclopedia of the Israeli-Palestinian Conflict: Vol. 3, R-Z (Boulder: Lynne Rienner, 2010), p. 1572; William L. Cleveland with Martin Bunton, A History of the Modern Middle East (Boulder: Westview Press, 2016), pp. 320-5. Ernest C. Dawn, "The Egyptian Remilitarization of Sinai," Journal of Contemporary History, July 1968, p. 213. William Stevenson, Israeli Victory (London: Corgi Books, 1967), p. 28; Charles W. Yost, "How the Arab-Israeli War Began," Foreign Affairs, Jan. 1968, p. 317-8; Maxime Rodinson, Israel and the Arabs (Harmondsworth: Penguin, 1968), pp. 198-200; Roderick MacLeish, The Sun Stood Still: Perspectives on the Arab-Israeli Conflict (London: Macdonald and Co., 1968), p. 18. Efraim Karsh, "The Six-Day War: An Inevitable Conflict," Middle East Quarterly, Summer 2017. Trevor N. Dupuy, Elusive Victory: The Arab-Israeli Wars, 1947-1974 (New York: Harper and Row, 1978), p. 229-30. David Hirst, The Gun and the Olive Branch: The Roots of Violence in the Middle East (London: Faber and Faber, 1977), p. 211. Patrick Seale, Asad of Syria: The Struggle for the Middle East (Berkeley: University of California Press, 1988), p. 131. L. Carl Brown, "Nasser and the June 1967 War," in S. Seikaly, R. Baalbaki, and P. Dodd, eds., Quest for Understanding: Arabic and Islamic Studies in Memory of Malcolm H. Kerr (Beirut: American University of Beirut, 1991), p. 134. John Quigley, The Six-Day War and Israeli Self-Defense: Questioning the Legal Basis for Preventative War (Cambridge: Cambridge University Press, 2013), pp. 44-5. See, also, Donald Neff, Warriors for Jerusalem: The Six Days that Changed the Middle East (New York: Linden Press, 1984), p. 196; Andrew and Leslie Cockburn, Dangerous Liaison: The Inside Story of the U.S.-Israeli Covert Relationship (New York: Harper Collins, 1991), p. 139. Norman Finkelstein, Image and Reality of the Israel-Palestine Conflict (London: Verso, 1995), p. 134. See, for example, Raymond Cohen, "Intercultural Communication between Israel and Egypt: Deterrence Failure before the Six-Day War," Review of International Studies, Jan. 1988, p. 10; Ben D. Mor, "Nasser's Decision-making in the 1967 Middle East Crisis: A Rational-Choice Explanation," Journal of Peace Research, 4 (1991): 368; Avi Shlaim, The Iron Wall: Israel and the Arab World (New York: Norton, 2001), pp. 236-7; Jesse Ferris, Nasser's Gamble: How Intervention in Yemen Caused the Six-Day War and the Decline of Egyptian Power (Princeton: Princeton University Press, 2013), pp. 267-8. Michael Oren, Six Days of War: June 1967 and the Making of the Modern Middle East (New York: Ballantine Books, 2002), pp. 58-9. See, for example, David Remnick, "The Seventh Day: Why the Six Day War is still being fought," The New Yorker, May 28, 2007, review of Tom Segev, 1967: Israel, the War, and the Year that Transformed the Middle East (New York: Metropolitan Books, 2007); Ali Gharib, "Michael Oren and the End of Liberal Zionism," The Nation, June 25, 2015. Raymond Aron, De Gaulle, Israel, and the Jews (London: Andre Deutsch, 1969), p. 72. Richard Parker, ed., The Six Day War: A Retrospective (Gainesville: University Press of Florida, 1996), p. 32, emphasis in original. See, for example, Richard Parker, The Politics of Miscalculation in the Middle East (Bloomington: Indiana University Press, 1993), pp. 16, 20, 41, 60, 98. William B. Quandt, Decade of Decisions: American Policy toward the Arab-Israeli Conflict, 1967-1976 (Berkeley: University of California Press, 1977), p. 60. Ibid., pp. vii-viii; Parker, The Politics of Miscalculation, p. xi; Parker, The Six Day War, p. 205. Odd Bull, War and Peace in the Middle East: The Experience and Views of a UN Observer (London: Leo Cooper, 1976), p. xv. Oren, Six Days of War, p. 184. Finkelstein, Image and Reality of the Israel-Palestine Conflict, pp. 125-7; Walter Laqueur, The Road to War 1967: The Origins of the Arab-Israeli Conflict (London: Weidenfeld and Nicolson, 1968), p. 233. Abba Eban, An Autobiography (New York: Random House, 1977), p. 373. Cockburn, Dangerous Liaison, p. 152; Randolph S. and Winston S. Churchill, The Six Day War (London: Heinemann, 1967), p. 70. "Contingency Planning on Arab-Israeli Conflict, May 22, 1967," U.S. National Archives (USNA), College Park, Md., Middle East Crisis Files 1967, Box 2, emphasis in original. Bernard Lewis, The Middle East: A Brief History of the Last 2,000 Years (New York: Scribner, 1995), pp. 364-5. Radio Cairo, May 24, 1967, as cited in Foreign Broadcasts Information Service (FBIS), May 24, 1967, B6. See also idem, FBIS, May 24, 1967 (B7), FBIS, May 26, 1967, FBIS, May 26, 1967 (B1). Ibid., May 26, 1967, FBIS, May 29, 1967 (B2). See, for example, Muhammad Hassanein Heikal, Nasser: The Cairo Documents (London: New English Library, 1972), ch. 7; idem, Sphinx and Commissar: The Rise and Fall of Soviet Influence in the Middle East (London: Collins, 1978), ch. 10; idem, 1967: Al-Infijar (Cairo: Ahram, 1990), pp. 317-30, 371-80, 419-25, 490-500. For Nasser's political manipulation of the alleged U.S. machinations vis-à-vis Egypt, see, for example, "President Nasser's Speech at Cairo University on February 22, 1967," FCO 39/245, The British National Archives, Kew, London; Minutes by D.J. Speares, Feb. 24, 1967, FCO 39/245, British National Archives; Letter from Fletcher to Unwin, No. 1036/67, Mar. 2, 1967, FCO 39/245, British National Archives. Anthony Nutting, Nasser (New York: Dutton, 1972), chaps. 19-20. Ibrahim Abu-Lughod, ed., The Arab-Israeli Confrontation of June 1967: An Arab Perspective (Evanston: Northwestern University Press, 1970), pp. 1-2, 5. Douglas Little, American Orientalism: The United States and the Middle East since 1945 (Chapel Hill: The University of North Carolina Press, 2008), p. 32. Hirst, "Greater Israel," The Gun and the Olive Branch, ch. 7. See, for example, Rodinson, Israel and the Arabs, p. 230. Maxime Rodinson, Israel: A Colonial Settler State? (New York: Monad Press, 1973), pp. 219, 234-5. Isaac Deutscher, "Interview with Isaac Deutscher: On the Israeli-Arab War," New Left Review, July-Aug. 1967, pp. 30-45. Fayez A. Sayegh, "Zionist Colonialism in Palestine," Palestine Liberation Organization Research Center, Beirut, 1965. Abdullah Schleifer, The Fall of Jerusalem (New York: Monthly Review Press, 1972), p. 102. Quigley, The Six-Day War and Israeli Self-Defense, p. 192. See, for example, Roland Popp, "Stumbling Decidedly into the Six Day War," Middle East War, Spring 2006, pp. 281-309; Ersun N. Kurtulus, "The Notion of a 'Preemptive War': The Six Day War Revisited," Middle East Journal, Spring 2007, pp. 220-38. Albert Hourani, A History of the Arab Peoples (London: Faber, 1991), p. 413. For criticism of Hourani's misrepresentation of the 1967 war, see Daniel Pipes' review of his book in The Wall Street Journal, Apr. 5, 1991. Tony Judt, "After Victory: Review of Six Days of War: June 1967 and the Making of the Modern Middle East by Michael Oren," The New Republic, July 29, 2002. Elie Kedourie, Islam in the Modern World and Other Stories (New York: Holt, Rinehart, and Winston, 1980), p. 187. Related Topics: Egypt, History, Israel & Zionism, Jordan, Syria, US policy | Summer 2017 MEQ receive the latest by email: subscribe to the free mef mailing list This text may be reposted or forwarded so long as it is presented as an integral whole with complete and accurate information provided about its author, date, place of publication, and original URL.